Blue Mountain Ski Resort is located in Palmerton, Pennsylvania. It's proximity to Philadelphia and South Jersey means that it attracts many skiers and snowboarders from those areas. Blue Mountain is approximately three hours from Baltimore, Maryland, and four hours from Washington, DC. The resort hosts an average of 300,000 visitors each year. Unlike other Pennsylvania resorts, Blue Mountain does not have ski in ski out lodging but there are numerous hotels, inns and bed and breakfasts located near the area. Blue Mountain was the first Pocono resort to offer an automated snowmaking system. This innovative snow creation device consists of a computer that is programmed to continually measure the surrounding weather conditions in order to determine the optimum combination of air and water. The resort has 100 percent snowmaking capabilities. Blue Mountain Resort is situated at a base elevation of 460 feet, which rises to a summit elevation of 1,600 feet. It receives an average of 33 inches of snowfall each year. Its 158 acres are home to 34 trails, which are serviced by nine lifts including two carpet lifts, one rope tow, one t-bar lift, one triple chair, one high speed detachable chair and one high speed six seater. Central Park: Central Park is home to the Big Air Bag which is similar to fall cushions used by stuntmen. This cushion of air is for skiers and snowboarders and allows them to try out tricks before attempting them on the slopes. Other cool features are master slide street style rails and boxes. The Sidewinder Park: Sidewinder is a wide terrain park. Its variety of unique jumps include a yellow school bus. Come Around Park: Come Around Park is Blue Mountain's intermediate terrain park. Terrain Run: Terrain Run is an intermediate terrain park, which is perfect for novice freestyle skiers and snowboarders. Finish Line: The Finish Line is perfect for beginners. It is located on a gentle slope at the bottom of the mountain that ends at Valley Lodge. At Blue Mountain, you can find both private and group lessons for kids and adults. In addition to the typical ski and snowboard lessons found at most ski resorts, Blue Mountain also has several signature lesson plans including women's only ski clinics, senior ski programs, junior racing and more. In addition, those who want to get a literal edge in their technique by learning to carve can take special carving classes. Skiers and riders who enjoy the rough ride can take the resort's signature mogul clinic. Blue Mountain also has a Nastar course where you can check your time against skiers and snowboarders of your age group. You will receive a Nastar pin according to your speed. 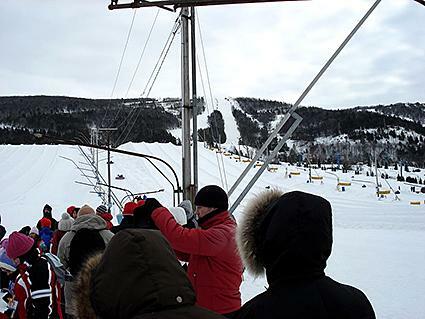 Blue Mountain usually opens in December and closes in March, weather permitting. The resort is open for skiing and snowboarding Monday through Friday from 8:30 am to 10:00 pm, and Saturday, Sunday and holidays from 8:00 am to 10:00 pm. Blue Mountain also offers snow tubing, which is available Monday through Thursday from 4:00 pm to 10:00 pm, Friday 10:00 am to 10:00 pm and Saturday, Sunday and holidays from 8:00 am to 10:00 pm. The resort is closed on Christmas. The Inn at Jim Thorpe: The Inn at Jim Thorpe is 20 miles from Blue Mountain. Located in the historic town of Jim Thorpe, this inn was built in 1849 and is done in old world style. The inn offers a range of amenities including massage and spa services and dining. The Straup House Bed and Breakfast: This charming B&B is six miles from Blue Mountain and is located in a traditional Pennsylvania farmhouse. This B&B offers private rooms, off street parking as well as breakfast and snacks. You can also find a great deal on a ski package for two that includes your ski or board pass and a full breakfast and snack. Country Inn & Suites: Located in Jim Thorpe, this hotel is just 15 minutes from Blue Mountain. In addition to comfortable rooms, guests can enjoy free high-speed Internet access, a fitness center and an indoor pool. Hampton Inn Lehighton: This hotel is located just 12 miles from Blue Mountain. It offers spacious guest rooms with a free hot breakfast included in your stay. Other amenities are a fitness center, indoor pool and Jacuzzi. While Blue Mountain may not have the extensive terrain offered by Colorado or Utah resorts, with low lift ticket prices and nearby lodging options it makes for a family friendly vacation and is a viable budget option. You can grab a bite to eat at the Slopeside Pub & Grill and enjoy a spectacular view of the mountain or find a great bar or restaurant in the surrounding area and enjoy all that the Pocono Mountains has to offer.